The Save-A-Deer whistle is the smallest and best single unit air-activated animal alert /automobile deer whistle design on the market today. When mounted to a vehicle, car, truck, or motorcycle moving at 35 mph or faster, the deer whistle makes a sound that alerts deer, moose, elk, antelope, and kangaroos of the approaching vehicle and assists with accident prevention. Animals are very unpredictable, but they will usually respond by freezing along the side of the road avoiding vehicle collision. Occasionally the animals will perk their ears and look over at the vehicle. You should always exercise caution when driving in areas heavily populated with animals. You should examine the deer whistle occasionally to be sure it is still mounted to the vehicle and does not have any blockage in the holes. 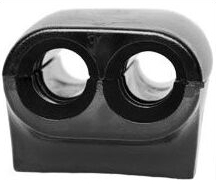 Our whistles make a great auto deer protection device to help reduce chances of deer and vehicle collisions. Over 2 million Save-A-Deer whistles have been sold world wide! Actual Size: 3/4 " Wide, 3/4" Tall, and 1" Long. Dual Construction/Single Mount: One unit replaces 2. Flexible Mounting: May be mounted upside down or right side up. Can be hidden in the grill or under the bumper. Flow-Through Construction: Totally different and superior system of function. Smaller Size: Low profile-car wash safe. Less than 1 cubic inch. Special Composition Material: Stands up to weather extremes. Superior Sound Range: Due to flow-through design. Installs in Seconds: Superior mounting material. Perfect for Motorcycles: The only unit small enough to fit on motorcycles. Made in the USA: Made with U.S. Materials. Highly Tested: Testing done in high-density deer population areas. Self Cleaning: Flow through construction is less likely to clog. Motorists, emergency vehicles, state and local law enforcement agencies, insurance companies, business and corporate fleets, truckers, motorcyclists, nature stores, organizations, and retail store drivers all enjoy the benefits of the Save-A-Deer whistle. Our deer whistles are easy to install and mount on a vehicle in just seconds. Discounts are available for larger quantity orders. The Save-A-Deer whistle comes with a 30-day, money-back guarantee. Living Products has been in business since 1988, creating the best product on the market. We do one thing, and we do it well. Our product is made in the U.S. with U.S. materials. 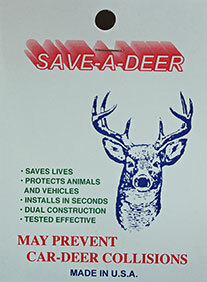 The Save-A-Deer whistle was tested by Business Research Group in Bellvue, Iowa, along with 8 other models on the market. Save-A-Deer whistles were found to be 92% effective at freezing (stop moving) the deer. It was tested in Iowa on White tail deer, Wisconsin on white tail deer, and Colorado on mule deer. Please go to the Research page for further test result information.